DraftKings is a Boston fantasy sports company. With offerings in all the major sports and multiple other verticals it’s a year round passion for many. You can sign up with the use of a coupon, but you need to follow the steps below to be successful. The confusing thing about using a draftkings promo code is that unless you are extremely attentive to details, you will easily miss where it goes. Partly due to the way the site is designed, by default you repeatedly get sent to the “lobby”. However the lobby is not the starting point from which you can enter your coupon. But never mind that now, let’s get back to where the promo code goes. 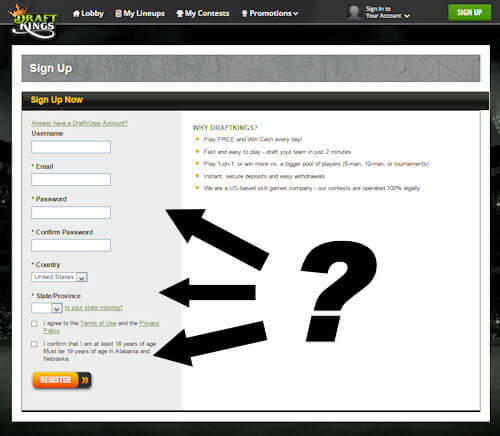 Follow the steps below and the question “Where Do I Enter a Promo Code on DraftKings” will be answered. If you try and “sign up” after browsing the site for a few minutes, you will be taken to a page that looks like the one pictured below. There is no place to enter your promo code. This step will give you a second chance to use the code, click the link marked “continue” that is located below and you will be taken to a fresh page that has a link entitled “Enter Promo Code”. This tutorial was last verified on Feb 3, 2019 @ 5:16 pm.